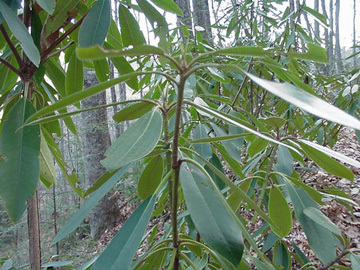 The thick, leathery leaves on the rhododendron bushes were curled tighter than a homemade twist of tobacco. As mountain weather sharps well know, it’s a sign of winter for a fact when rhododendron leaves, though evergreen, droop and roll inwards, Up here, where rhododendron lavishes the mountain slopes and coves, the weather sharps are keeping one eye on the long glistening leaves and the other on the elements. Between the two, what with some help from the almanac and a feeling in their bones, they make weather prognosticating as easy as falling off a log and a heap sight less uncertain. Like the old-timer who reckoned there was no need for a clock if a body had a good crowin’ rooster, these mountain weather prophets figure a body’s a plumb fool to squander money on a store-bought thermometer when the mountains are thickety with rhododendron. They’ll tell you, with a wisdom born of the hills, that a body can depend on rhododendron as a gauge for cold weather with the faith of Scripture.All a body’s got to do is make a habit of studying the leathery green leaves and know their tell-tale signs. For every leaf is a thermometer, nature’s own special agent for measuring the cold when winter comes to the mountains. To the weather sharps, a rhododendron leaf reacts the same way as mercury in a store-bought thermometer. Its droop and curl tells the temperature. Until cold weather comes on, until winter storms the high peaks, the thick leaves of the rhododendron stand out like rabbit-ears.